German physician; born at Neusalz-on-the-Oder April 6, 1847; educated at the gymnasium of Görlitz, Silesia, and at the University of Breslau, where he studied medicine. The Franco-Prussian war interrupted his studies, Lazarus serving as assistant surgeon. He is still connected with the army as surgeon of the landwehr. At the close of the war he resumed his studies at the University of Berlin (M.D. 1872). He became assistant to Traube and was detailed to a military hospital as surgeon. At twenty-six he received the Prussian Order of the Crown. Since 1875 he has lectured at Berlin University as privat-docent to the senior medical classes during the summer vacation, receiving the title of "Sanitätsrat" in 1896, and that of professor in 1901. 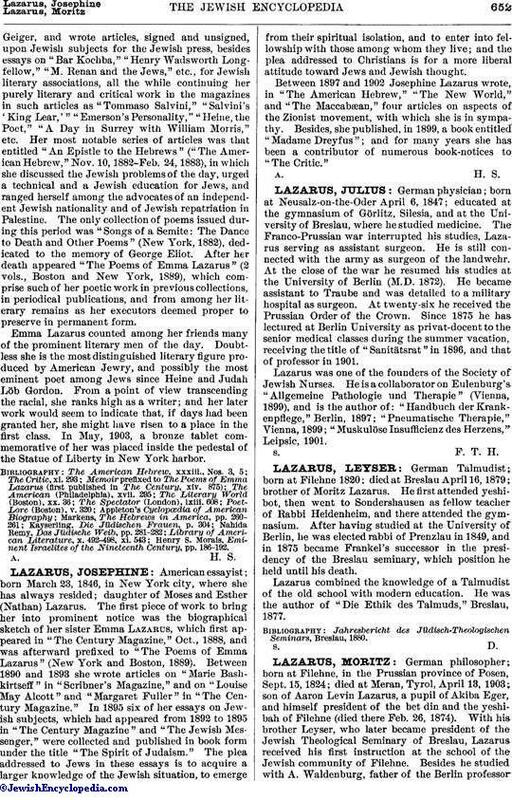 Lazarus was one of the founders of the Society of Jewish Nurses. He is a collaborator on Eulenburg's "Allgemeine Pathologie und Therapie" (Vienna, 1899), and is the author of: "Handbuch der Krankenpflege," Berlin, 1897; "Pneumatische Therapie," Vienna, 1899; "Muskulöse Insufficienz des Herzens," Leipsic, 1901.